Stanley Tree Service has the experience and professionalism to trim your trees and protect the property that is important to you. We are not amateurs who will show up today and then gone if there is a problem. We are insured so that you can trust our work. We've successfully tackled dozens of extremely difficult situations right here in East Texas where one wrong move could cause significant damage to homes or businesses. That's why both commercial and residential customers trust Stanley Tree Service time and time again! Call us today for a free quote! 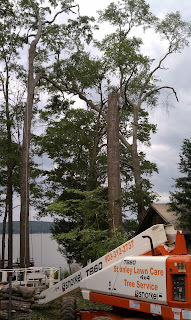 Trust the professionals at Stanley Tree Service. We recently added more photos...Click here!